Women pro-democracy protesters in Hong Kong are being targeted with sexual assaults and harassment, demonstrators and an international human rights group said as violence broke out in two of the city's busiest shopping districts. Amnesty International accused the police of "failing in their duty" to protect protesters from violence on Friday evening, and said that women and girls had been attacked. "Women and girls were among those targeted, including incidents of sexual assault, harassment and intimidation" in the commercial hubs of Mong Kok and Causeway Bay, Amnesty said in a statement. The assaults came as police failed to control groups of anti-Occupy protesters who targeted pro-democracy demonstrators in violent scenes on Friday evening. An AFP reporter spoke to one young woman protester in Causeway Bay who said her three friends had been assaulted by a man who was opposed to the Occupy movement, whose supporters have vowed to stay on the streets until their goal of universal suffrage is achieved. The three women were all crying as they were bundled into a police van. "We are making further inquiries -- these girls say they were indecently assaulted," a police officer on the scene told AFP. 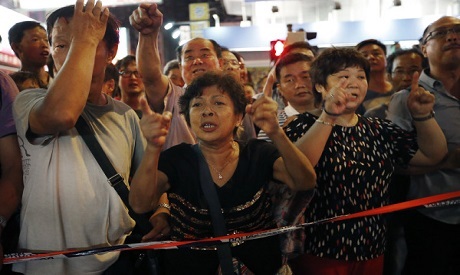 Amnesty said that a woman at the Mong Kok clashes had also been attacked. "A man grabbed her breasts while she was standing with other protesters at around 4:00 pm (0800 GMT)," they said in a statement. "She also witnessed the same man assault two other women by touching their groins," it added, with other protesters intervening to help. Tensions remained high at protest sites in Hong Kong Saturday with fears over further reprisals and journalists also being targeted.